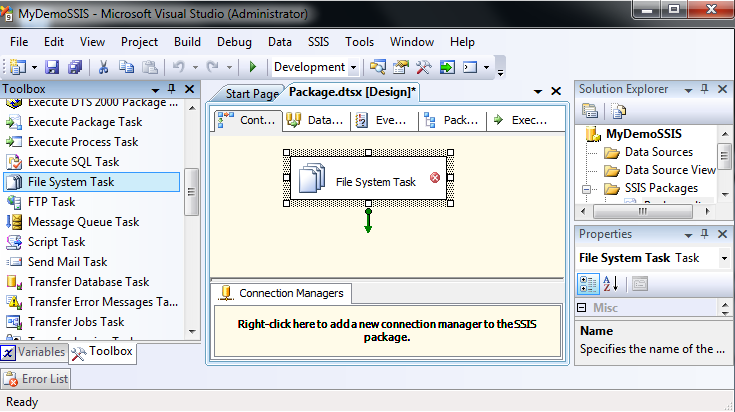 In SSIS (Sql server integration services) we can copy any types of file from one location to another location by using File System Task. 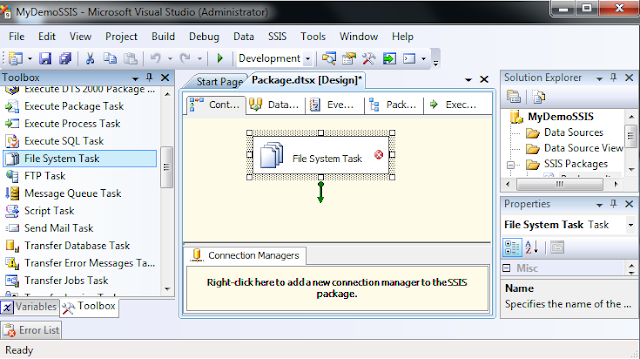 Step 1: Create a new integration services project. 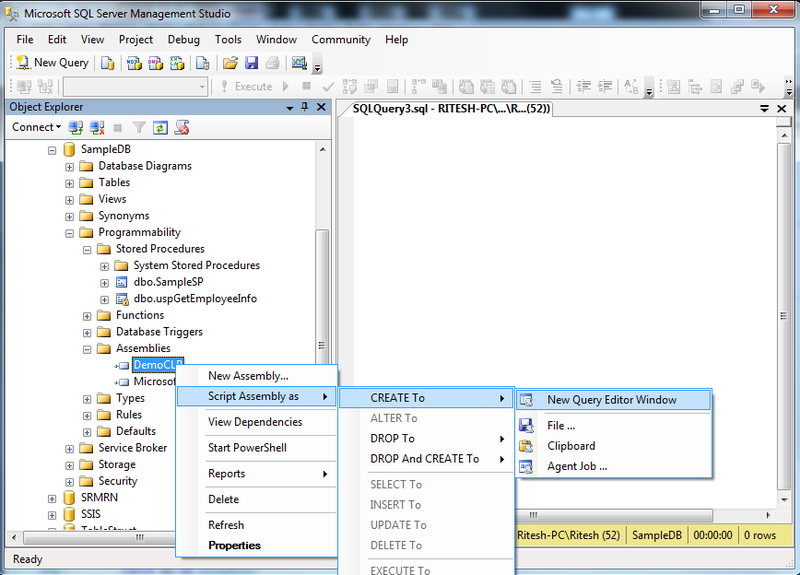 Step 2: In control flow tab, drag and drop the File System Task. 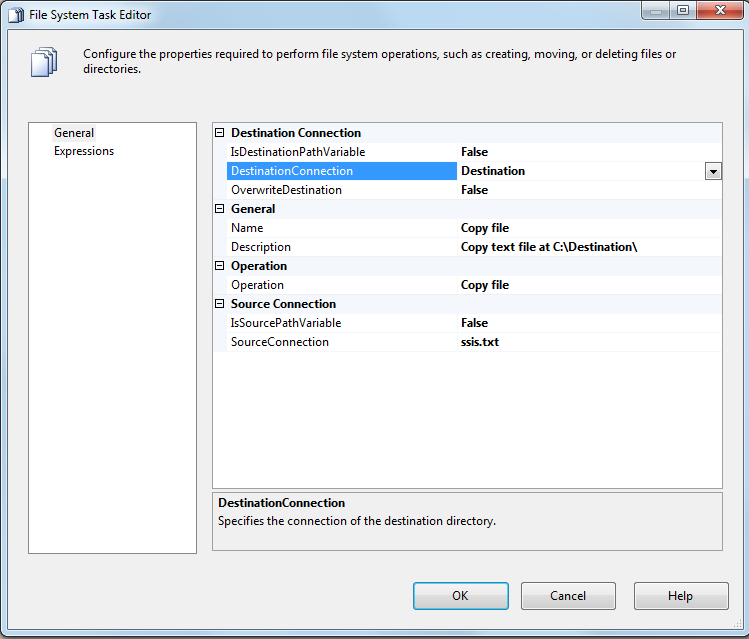 Step 3: Double click on File System Task. We will get the File System Task Editor. Name: It can be any name of task. 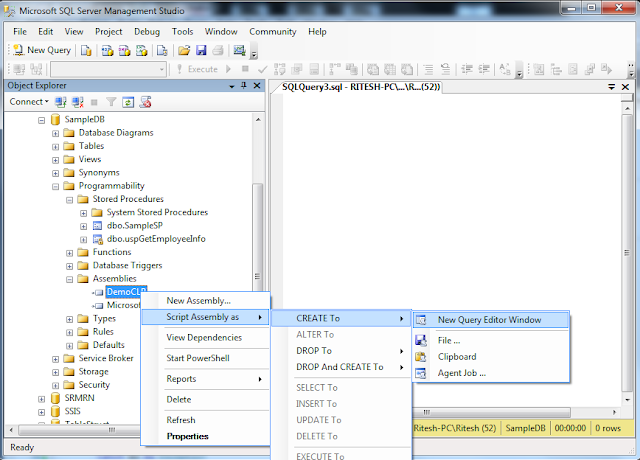 In this example task name is Copy file. To create a new folder at given path. To delete an existing folder. To delete the all content of a folder. To move a folder from one location to other. To copy a folder from one location to other. To copy a file from one location to other. To move a file from one location to other. To rename a given file. 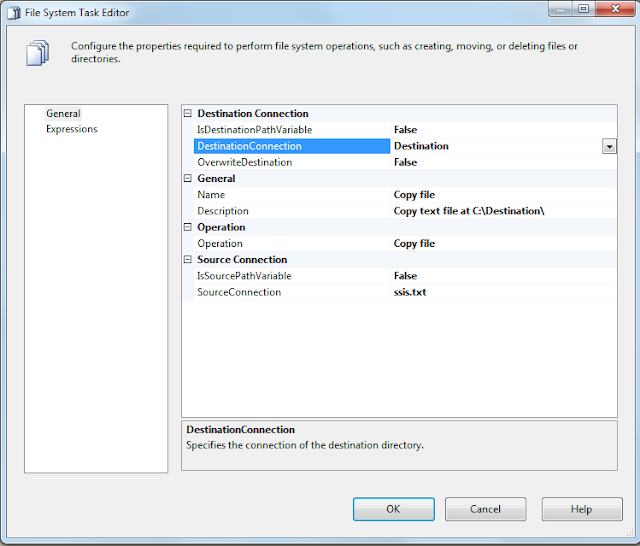 In this example we have to copy a file from one location to other so operation name will be Copy file. IsSorcePathVariable: It can be either true or false. If it is true then path of the source folder will stored in a variable. If it is false then path of the source folder will be static. In this example we will go for both the options. Option 1: Set the IsSorcePathVariable to true. 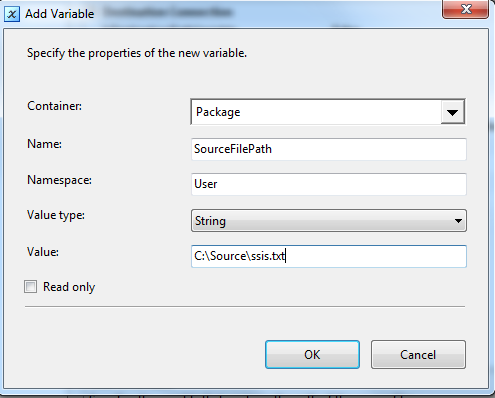 Source variable: To specify path of the source folder which we have to copy. Select <New Variable…> from combo box. We will get the Add variable window. Container: To specify the scope of the variable. 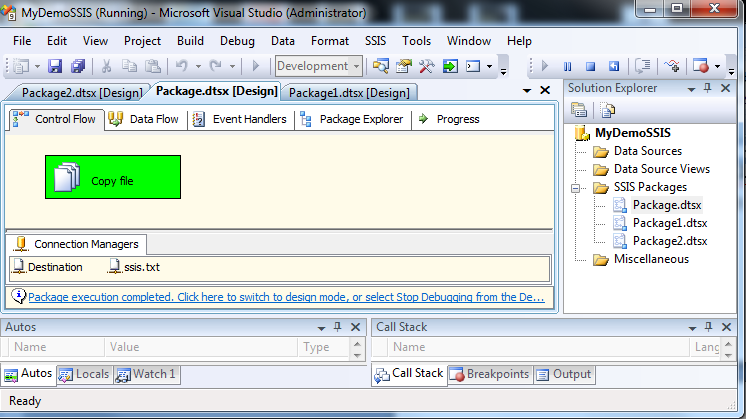 In this example we will use Package (write name of your package). It means scope of variable is whole the package. Name: Any name of the variable. In this example name of the variable is SourceFolderPath. NameSpace: It can be either User of System. User means user defined variable. We can write any name of namespace of user defined variable. In this example we will keep User. Value Type: Data type of variable. Since we have to store path of a folder so, we will choose String. Option 2: Set the IsSorcePathVariable to false. 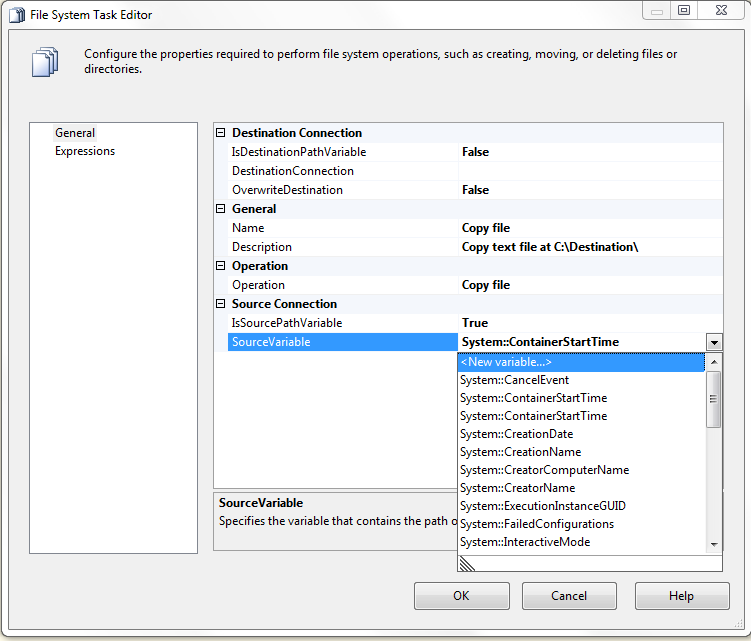 SourceConnection: To specify the path of the source folder. Choose the <New connection…> from combo box. We will get File Connection Manager Editor. Usage type: In this example choose the Existing file. File: Click browse button to choose the source file which you want to copy. IsDestinationPathVariable: It can be either true or false. If it is true then path of the destination folder will be stored in a variable. If it is false then path of the source folder will be static. Same way as we have done in case of source file. In this example we will set to False. OverwriteDestination: It can be either true or false. If it is true then while copying it will overwrite if the files and folders of source folder are already present in the destination folder if it is false then it will be not been overwritten. In this example we will keep True. 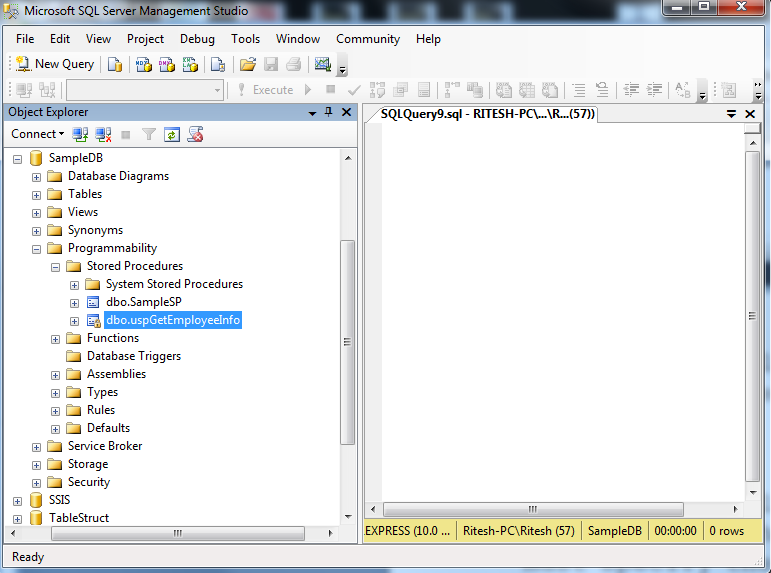 Assembly '' was not found in the SQL catalog of database ''. Msg 15135, Level 16, State 8, Procedure sp_addextendedproperty, Line 37 Object is invalid. Extended properties are not permitted on '', or the object does not exist. Msg 15135, Level 16, State 8, Procedure sp_addextendedproperty, Line 37 Object is invalid. Extended properties are not permitted on '', or the object does not exist. Assembly '' was not found in the SQL catalog of database ''. Object is invalid. Extended properties are not permitted on '', or the object does not exist. You have not created the assembly of your CLR object. Deploy error SQL01268: .Net SqlClient Data Provider: Msg 6212, Level 16, State 1, Line 1 CREATE ASSEMBLY failed because method '' on type '' in safe assembly '' is storing to a static field. Storing to a static field is not allowed in safe assemblies. Set the permission level of your project unsafe. 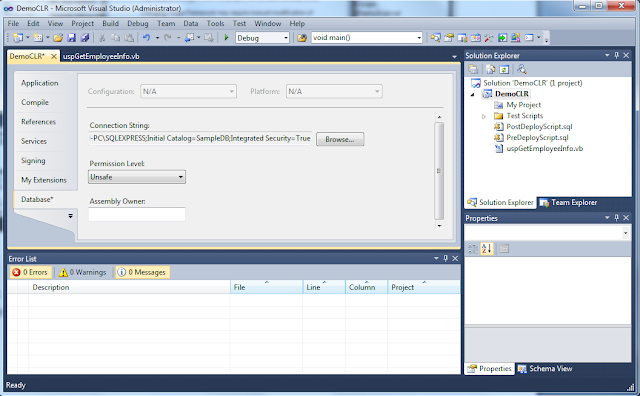 For this select Database tab in properties window of your project and choose Permission level Unsafe. Now build the project solution. Deploy error SQL01268: .Net SqlClient Data Provider: Msg 6212, Level 16, State 1, Line 1 CREATE ASSEMBLY failed because method '' on type '' in external_access assembly '' is storing to a static field. 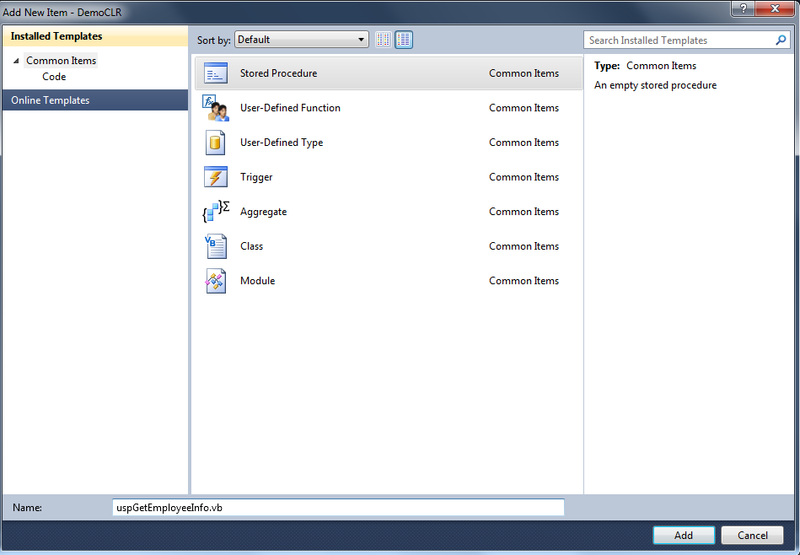 Storing to a static field is not allowed in external_access assemblies. Msg 6263, Level 16, State 1, Line 4 Execution of user code in the .NET Framework is disabled. 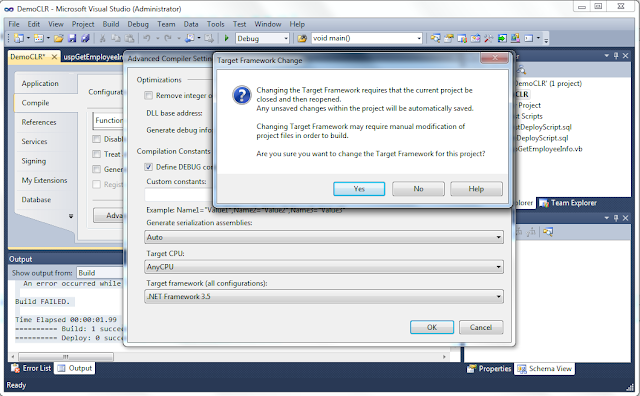 Enable "clr enabled" configuration option. 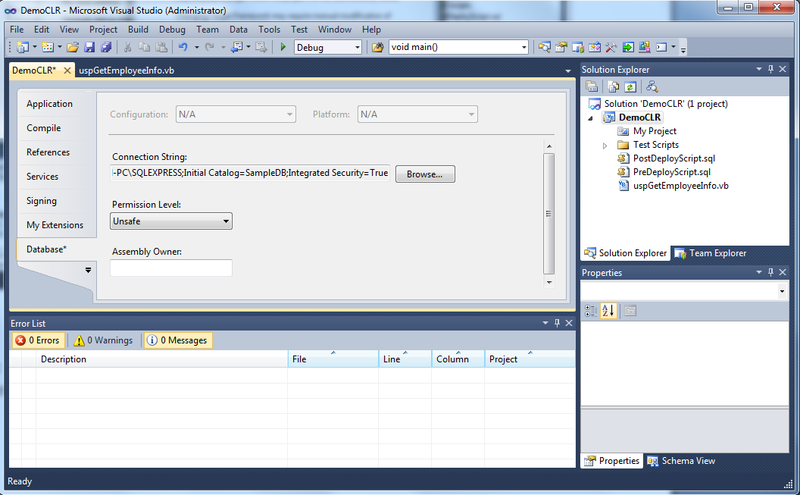 Execution of user code in the .NET Framework is disabled. Enable "clr enabled" configuration option. 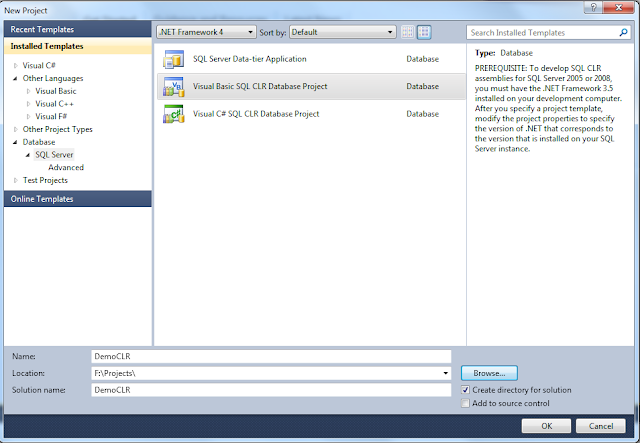 Cause: In your sql server execution of CLR objects has not been allowed. Deploy error SQL01268: .Net SqlClient Data Provider: Msg 10327, Level 14, State 1, Line 1 CREATE ASSEMBLY for assembly '' failed because assembly '' is not authorized for PERMISSION_SET = EXTERNAL_ACCESS. 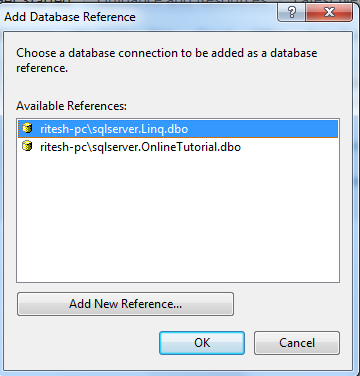 The assembly is authorized when either of the following is true: the database owner (DBO) has EXTERNAL ACCESS ASSEMBLY permission and the database has the TRUSTWORTHY database property on; or the assembly is signed with a certificate or an asymmetric key that has a corresponding login with EXTERNAL ACCESS ASSEMBLY permission. 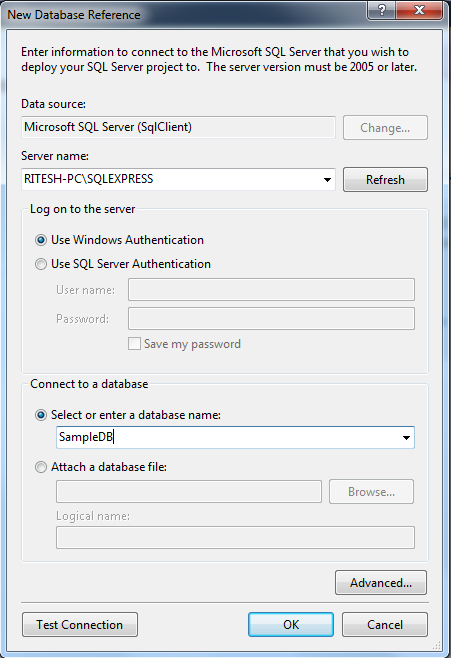 Note: Replace the SampleDB by your database name. Framework that is incompatible with the target instance of SQL Server: "Deploy error SQL01268: CREATE ASSEMBLY for assembly failed because assembly failed verification". 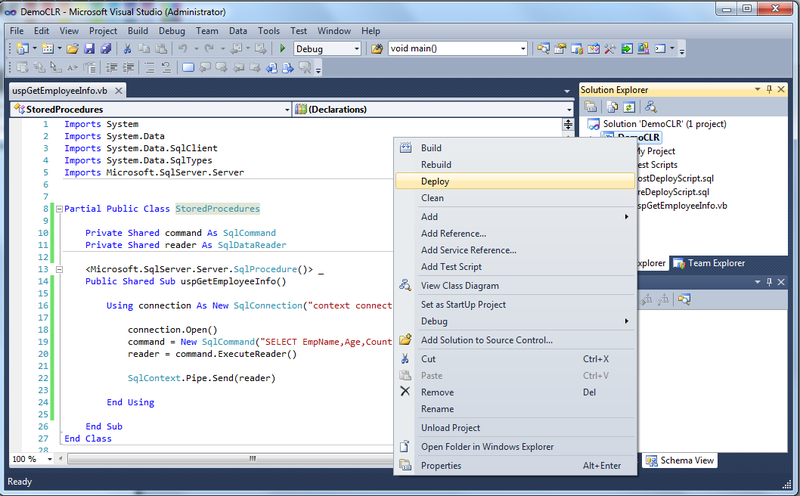 To resolve this issue, open the properties for the project, and change the .NET Framework version. Cause: It is due to mismatch of .net framework. Either you're creating CLR objects in visual studio 2010 in .net framework version 4.0 etc. And build the project solution. 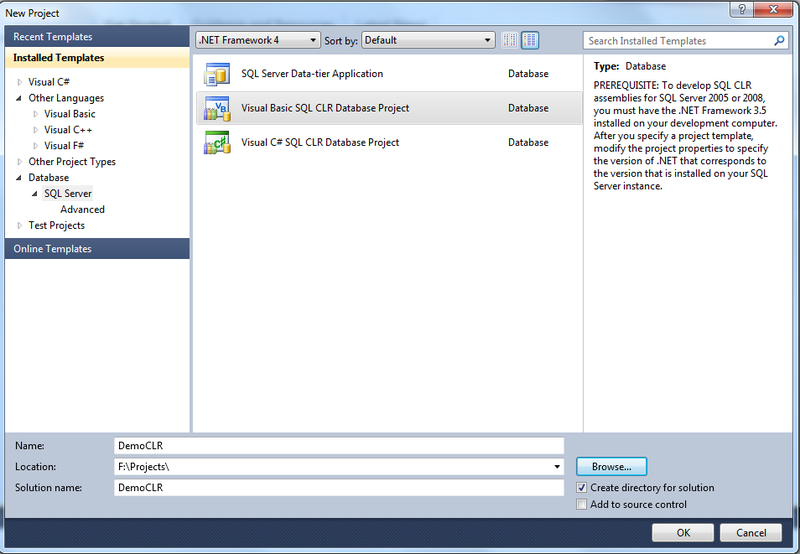 If you do not have the .NET Framework version 3.5 installed on your development computer, you must install it if you want to develop SQL CLR assemblies for SQL Server 2005 or SQL Server 2008. SQL Server 2005 and SQL Server 2008 support only those assemblies that target the 2.0, 3.0, or 3.5 version of the .NET Framework. 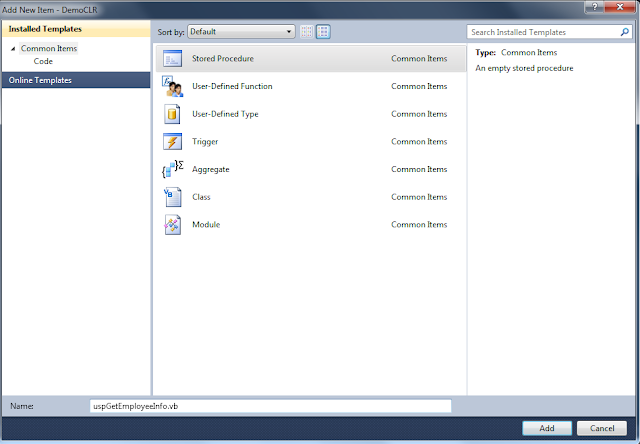 You specify the .NET Framework version in the project properties. Press F1 for more information. It is due to we cannot create sql objects like CLR stored procedures, CLR data types etc in .net 4.0 framework so it is necessary that your operating system must have .net framework of versions 3.5 or 3.0 etc.